“I can’t think of words to describe the experience,” said Sarah. “The work they do is amazing, and it is not until you get there that you realise how big an operation it is. It’s not only this huge hospital ship on which they perform surgeries, but also tents and buildings ashore where they set up an eye clinic, a dental clinic and waiting rooms that are packed with people every day waiting to get help. During my visit I got to see a surgery being performed, met patients and heard all of their stories. It was very emotional, but it also made me feel good to know we are a part of this. Our input might be small on the massive scale, but it has real impact,” she added. “Visiting the HOPE Centre was one of my best experiences, and we got to play with the children who were recovering there,” continued Sarah Scowcroft. 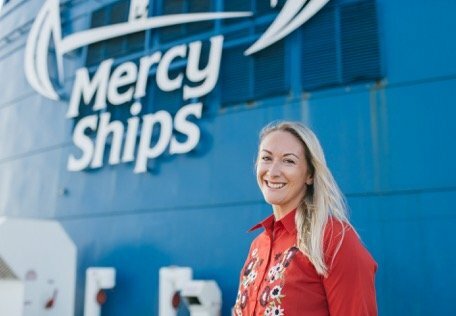 “To see first-hand the amazing work that Mercy Ships carries out was a truly life-changing experience and has made me realise that I need to do something for Mercy Ships every year now, for the rest of my life. I’ve been talking about it with the crew since I got back home, and it’ll be hard to top the 34 mile hike from last year, but we’ll figure something out,” she said. Sarah’s first initiative to raise money for Mercy Ships was in 2017 when she and a small group of Stena Line employees participated in a 25-mile charity hike. Last year’s 34-mile (55 km) hike, ‘The Three Loch Way’, usually takes three to four days to complete, but the group decided to do it in one – with a goal of raising £2,000.